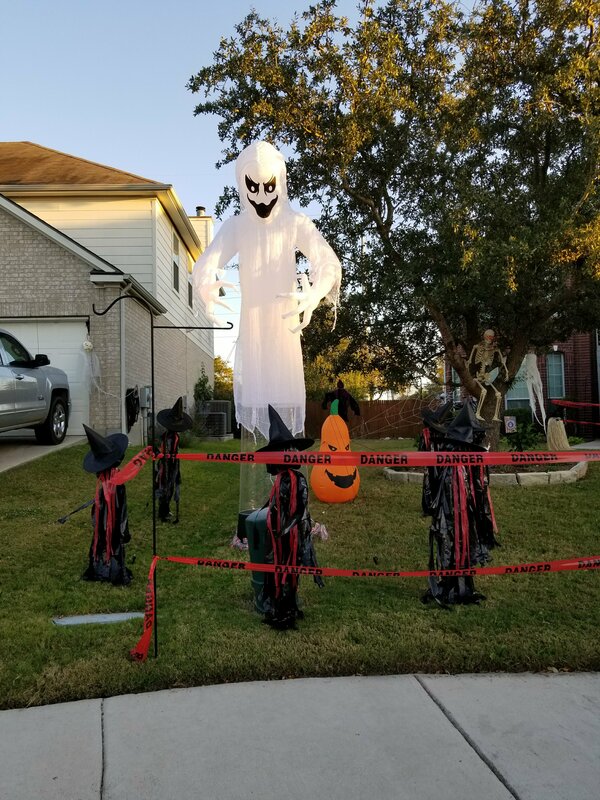 I need my display to make a big impact (because we are trying to get people to walk down a long street where no one else is decorating.) 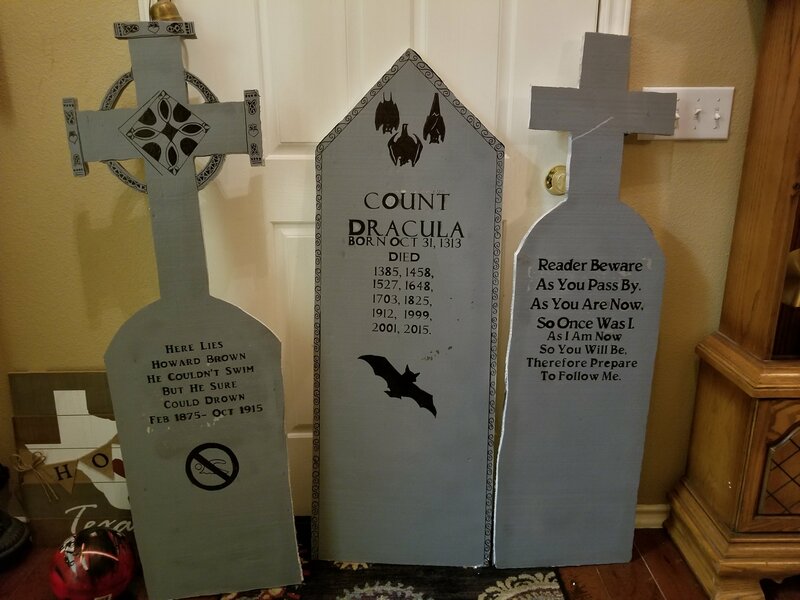 I’ll put time into projects, but it has to cost next to nothing AND draw people down our lame, dark street that doesn’t have a lot of people participating. 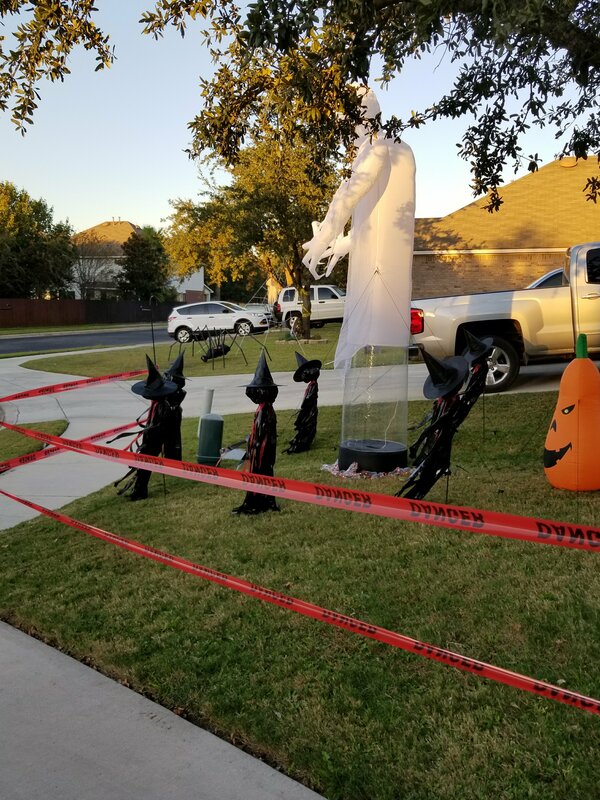 Our entire subdivision really gets into Halloween but for some reason not a lot of people do on the side streets near our home. Here’s to hoping that they get in the spirit next year! 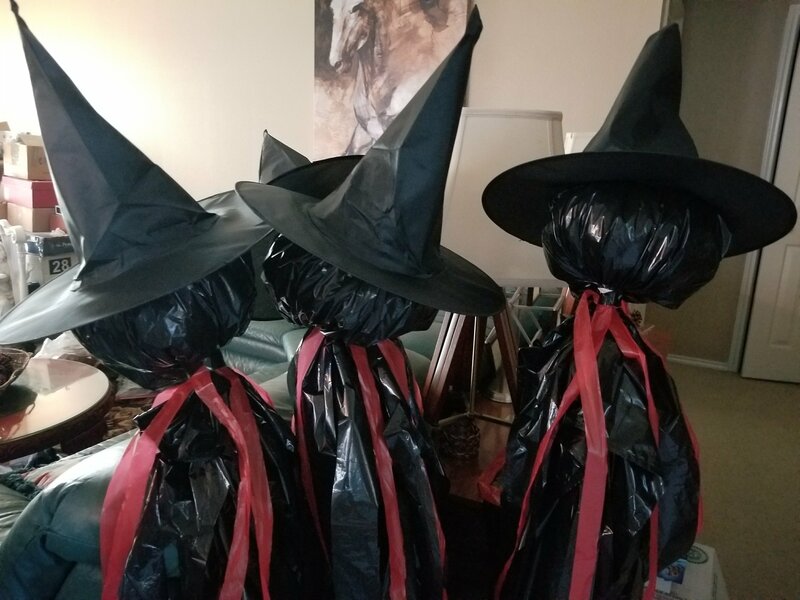 It’s a circle of witches, and it turns out even better if you have something for them to stand around. 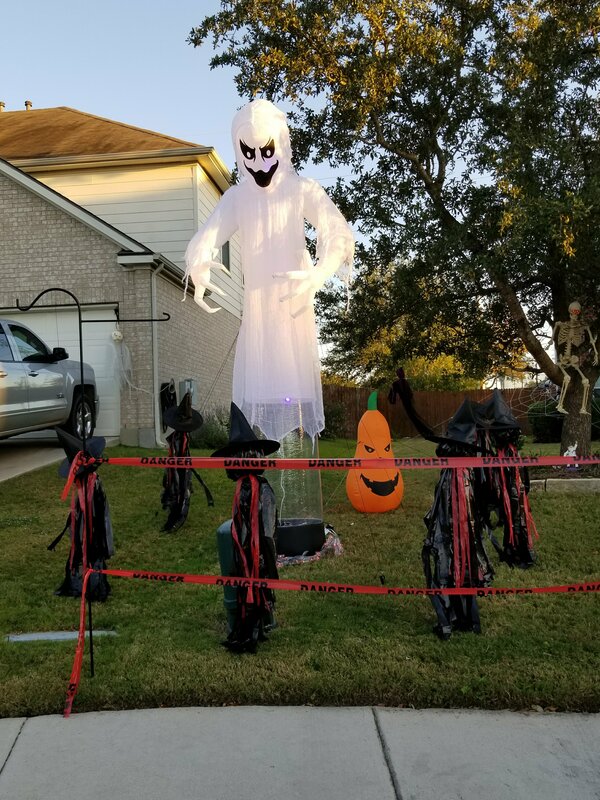 This year we got a 12 foot blow up ghost on a half price sale. 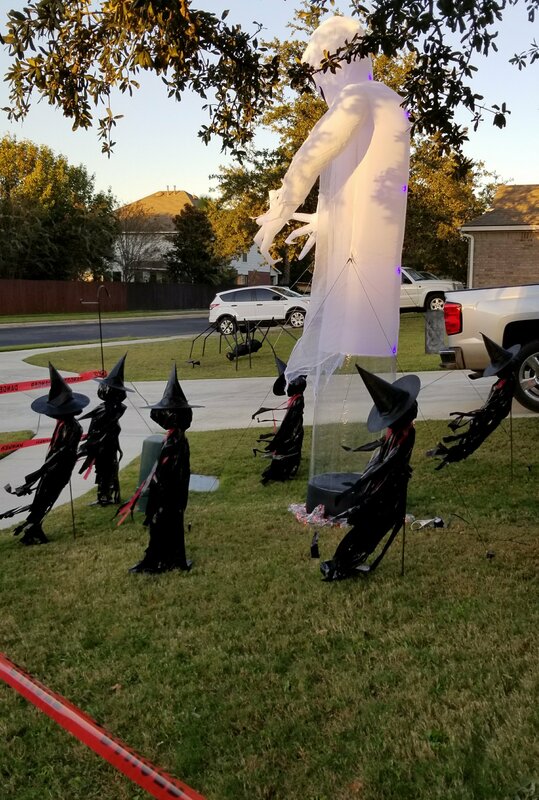 My witches are going to make my 12 foot ghost even more impressive! 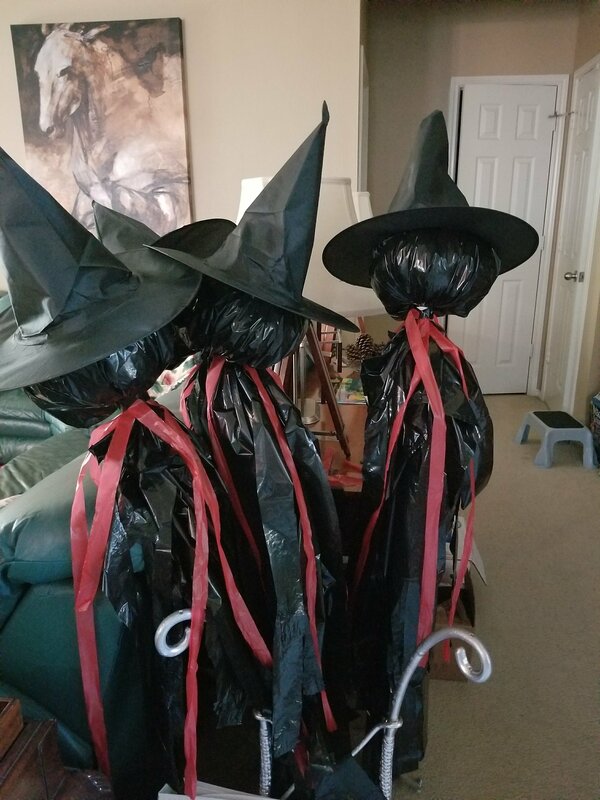 For each witch you will need: 1, 4 foot length of rebar, 3 lawn and leaf size black plastic trash bags, 10-15 plastic grocery bags, black duct tape, a glue gun and cheap bulk witch hats off of ebay or somewhere else online (I got a package of six here for about $10.) 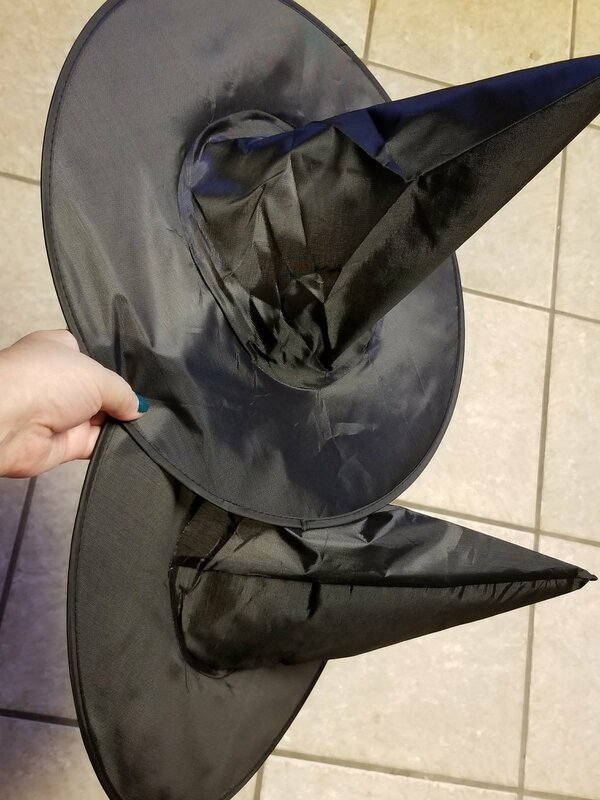 To get cheap witch hats outside of listed as “in stock” ones on Amazon, you will literally need to enlist the help of a slow boat from China. If you do not have Amazon prime, and you order directly from China, this needs to be ordered at least a month ahead of time to be sure they arrive in time. Always check when they estimate delivery for anything you order online. 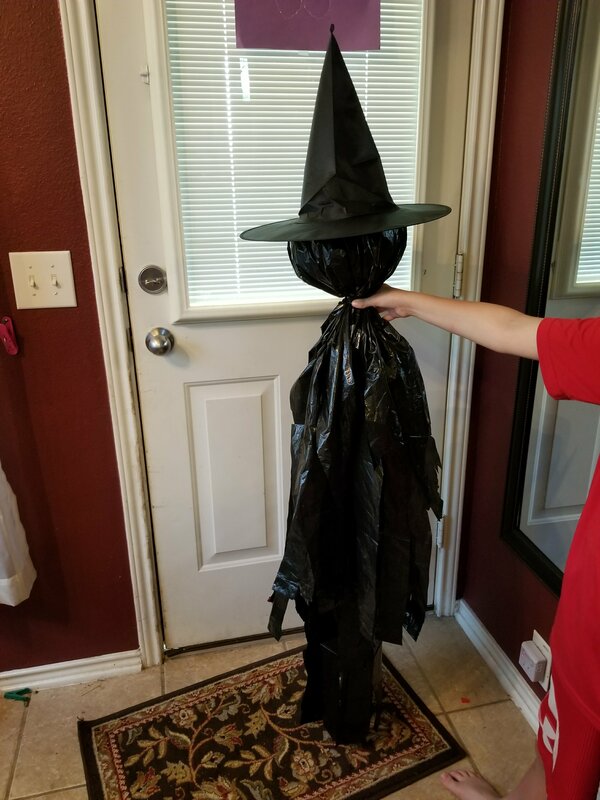 If it’s too late to get the hats, just switch to white trash bags and you can make ghosts instead. For ghosts: use these directions, omitting the witch hats. You probably have everything else! If you don’t have the duct tape, you can find it in the paint aisle of your local home improvement or big box store. And hot glue is standard for crafting. If you don’t have a glue gun, trust me, it won’t go to waste if you purchase one. I get mine out all the time to create, or fix, just about everything! Now let’s get down to the witches! 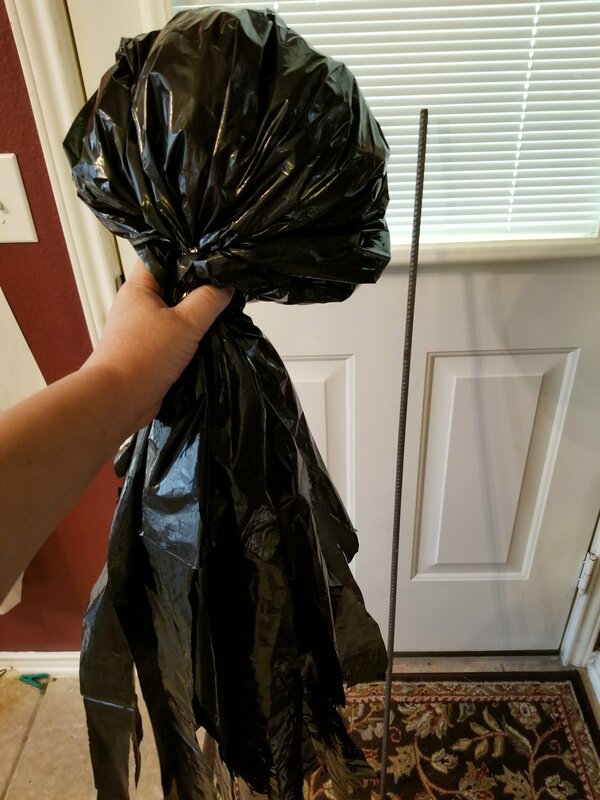 The first part is cutting up your lawn and leaf trash bags. First pull out the tie strips (if you have them) and cut them off as close to their base as possible on all three bags. Don’t throw the ties away! You can use them in a minute. Next you will need to shred two of the three bags. 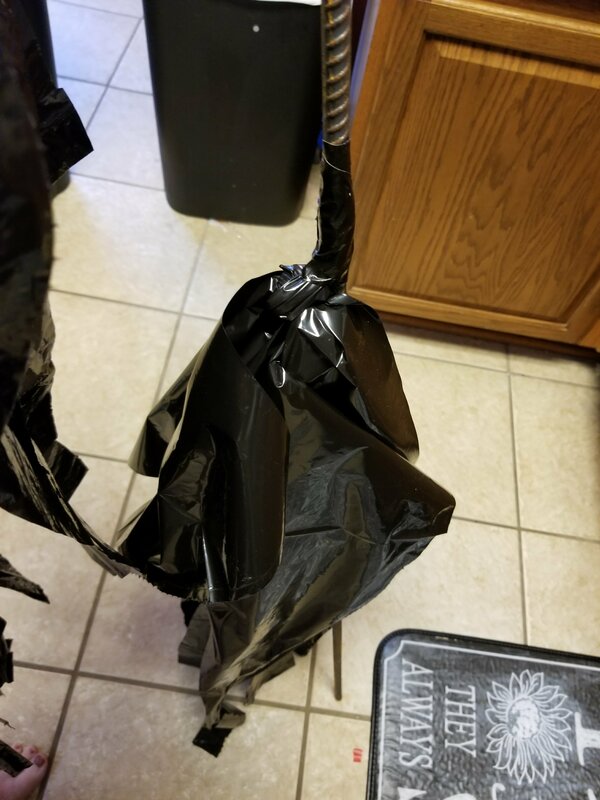 The easiest way to do this is to fold your trash bag in half. 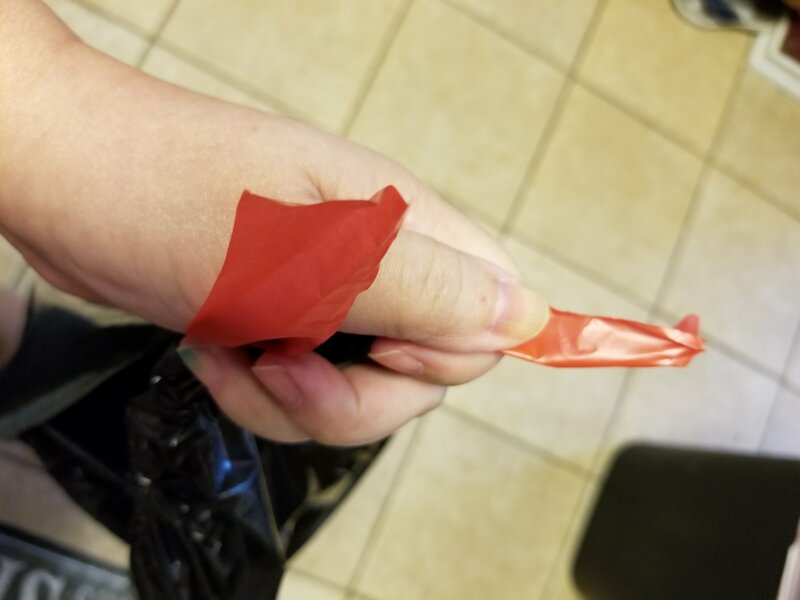 (This makes 4 single ply layers) cut through the area that had the ties (if your bag had them) which will be the opening that came on the bag. 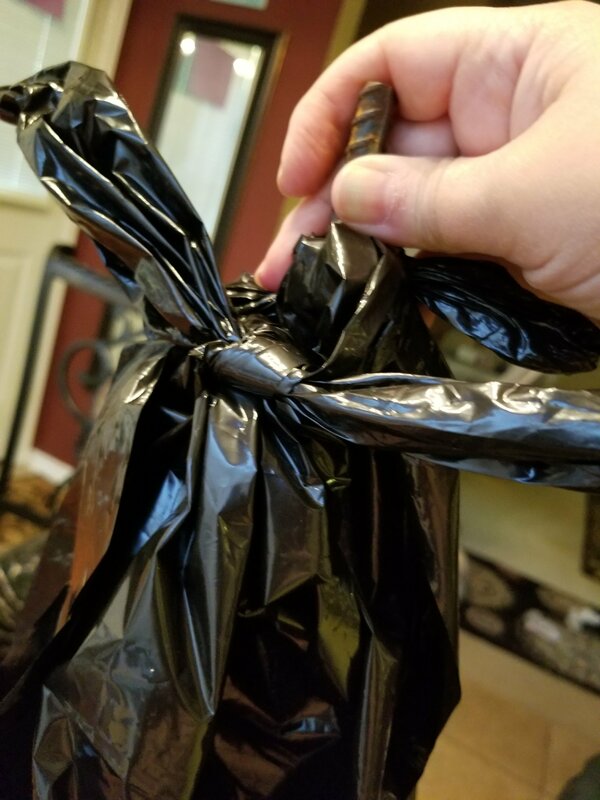 Hold the bag on either side of the scissors with your fingers and slide the scissors up through the bag, slicing as you go. 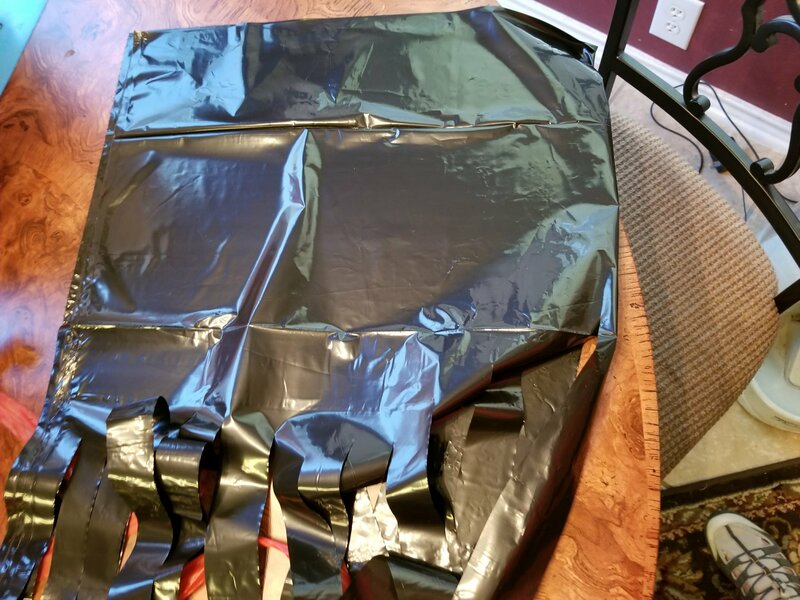 This is the same thing as when you cut wrapping paper for the holidays. It should just slice as it moves along: you shouldn’t have to move the scissor handles. 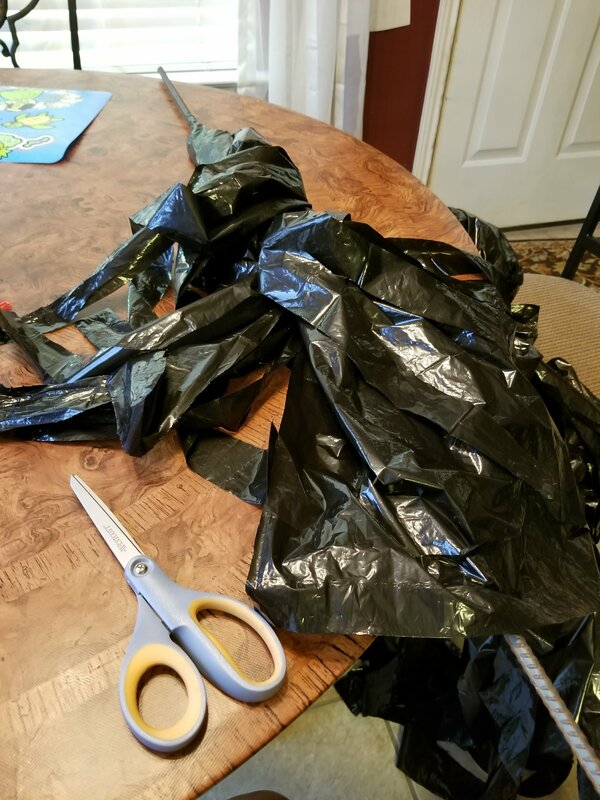 Try and cut in fairly straight lines through about 1/2-2/3 of the bag, leaving 1/2-1/3 uncut (you’ll come up with your preference for the perfect amount to cut as you make more of these.) 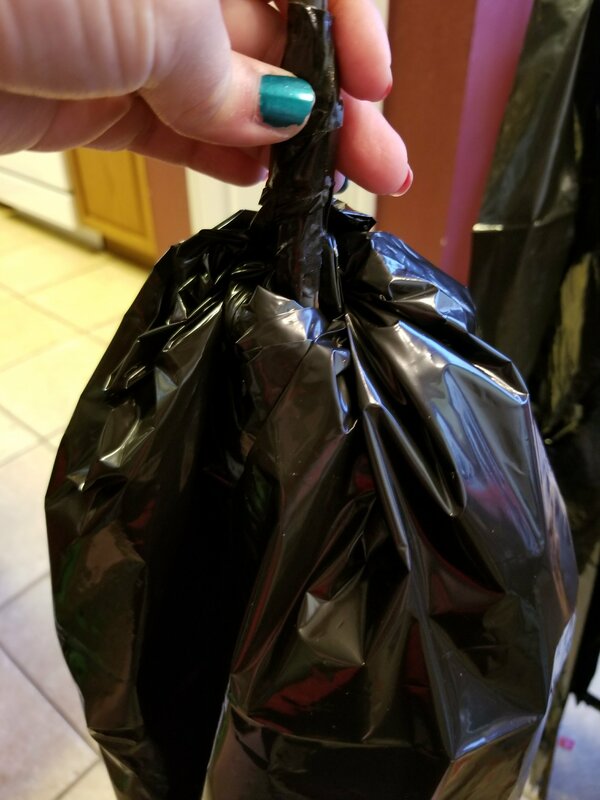 Do this to 2 of your 3 bags you will use per witch. At the bottom (closed end) of your bag, cut a 3 to 4 inch hole in the middle. This will make some lengths you can tie on the rebar. My cut is angled and crooked. You can see the idea here, you definitely do not need to be perfect for any of this project! Now that the first two bags are cut,put them aside. It’s time to make the head. 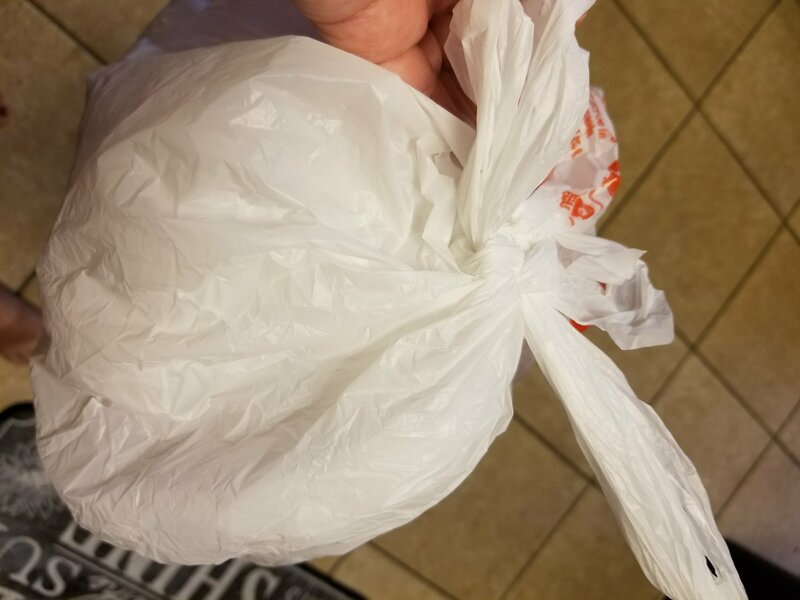 For the head you need to take your grocery bags and fluff them up. Don’t try and use anything made of paper for this. 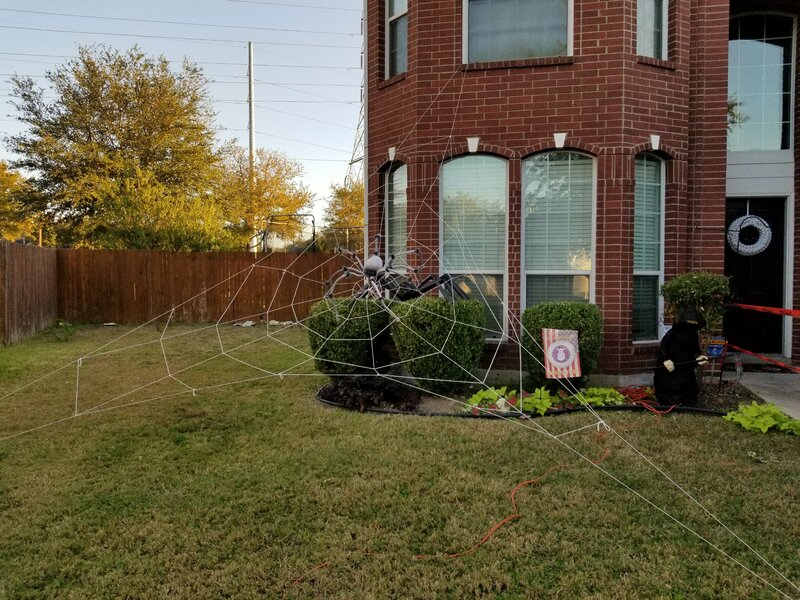 The overnight dew (or rain, or sprinklers) will ruin what you made if you use paper. 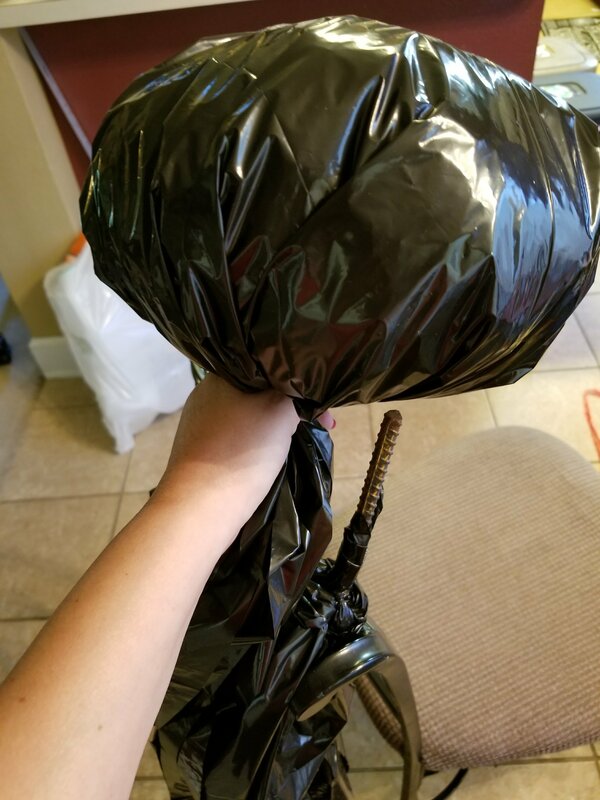 Stuff the witch head (and anything you make for the outdoors) with something that is waterproof (like trash bags or grocery bags). You should loosely ball up the grocery bags. A good rule of thumb is to fill a single grocery bag completely full of the fluffed ones. You should have the right size for a head that way. 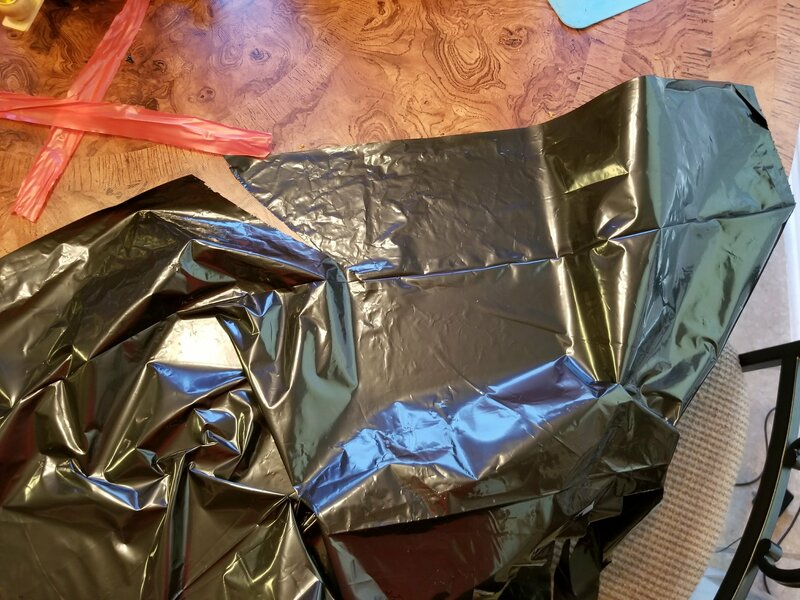 Cut some lengths of duct tape maybe 8 or 10 inches and then cut it in half length-wise so you have two narrow long strips. Put one end of each of the pieces on whatever you are working on: table, counter, whatever. Take your 4 foot rebar (these are always rusty so make sure you don’t do this over carpet/upholstery or while you are wearing nice clothes!) and slide your witch’s head onto it. As you are holding the head, fold any excess or corners down around the rebar. Take one of your strips and carefully put it around the neck of the witch’s head. It needs to be fairly tight but: you are going to slide it back off to hammer the rebar in the ground, and then back on, when you are done. This is all you need for the neck. Make sure that you have the rebar inside of the stuffed bag so you can fluff or reposition the head the way you like it. Before you set her head aside: lay the head across a table, floor or counter. 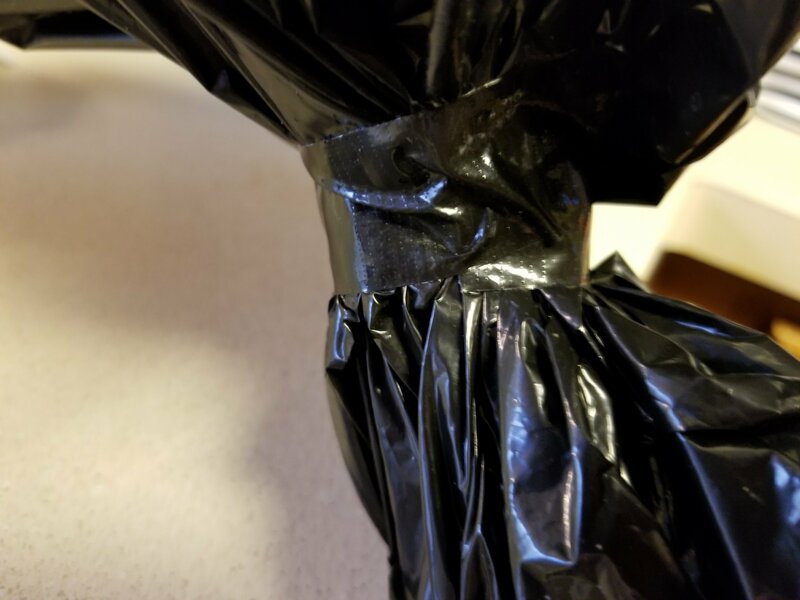 Cut strips up the bag until you are close to the taped neck area. I don’t cut the heads with the other bags because I found it is really difficult to guess how much space the head will take up. You don’t want the head part to be cut in strips, just the dress part of it. 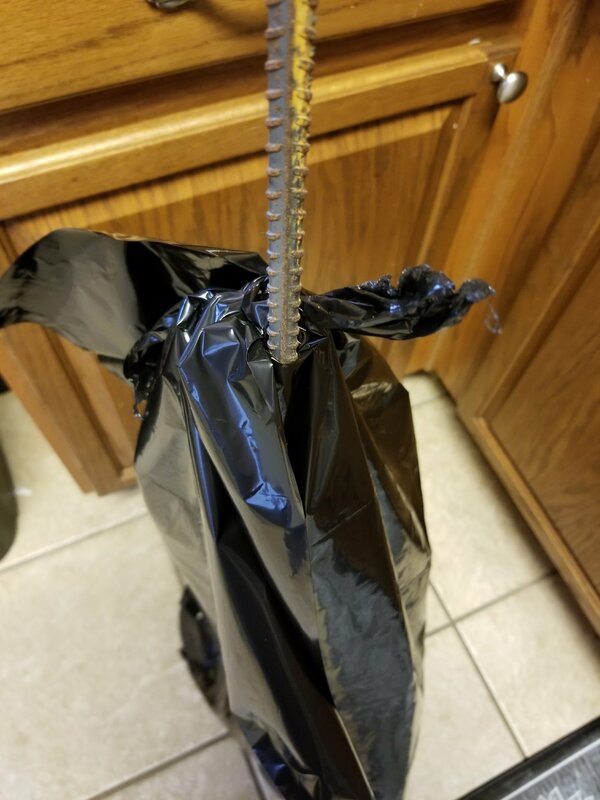 I also didn’t cut the bag while it was on the rebar because I was getting crooked cuts. As some cuts crossed: I lost bits of the witch dress. This is optional: depending on if you like the look. I used the second strip of duct tape, to anchor the ties I cut off earlier. It was just to add a little decorative detail and because then: I’m not wasting anything. 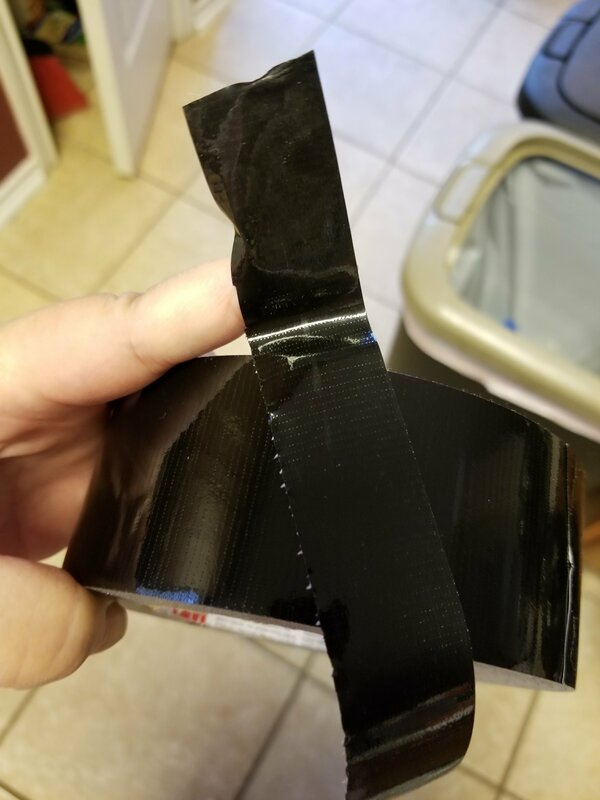 If you want to try this: place the ties ends very close together on the tape. It doesn’t take much tape to go around the neck and you have some control over how it looks if they are very close together. Remove the witch’s head and set it to the side. Take one of your cut up bags and slide the rebar through the center that you cut. Put the end of the rebar on the ground and bring the bag up, so that: the strips hang like a skirt around the rebar. Tie the center edges that you cut together. You can see the center cut that I made is how I tied this knot, while the outer edges of the bag are not tied yet. Place some duct tape around the tied end so it is firmly attached to the rebar and won’t slip. Then tie the ends (of the corners of the closed end of the bag) together. Tape the knot ends in the same way you did the center cut knot. This will give you some fluff so that the skirt has some shape. Next slide the second cut up bag onto the top portion of the rebar. You need to position this right under where the head will sit. If you forgot where that is: just slide the head back on and check. 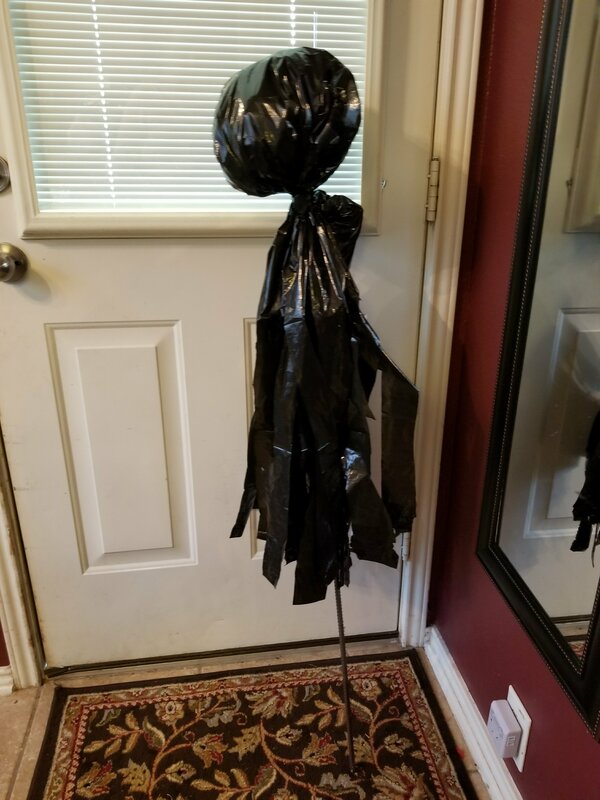 Once you have tied and taped the second part of your witch’s dress, place the head back on top. To place them in the ground: take the head back off one last time. Bring your witches to the area you are installing them. Place the witches on the ground, laying them down in the pattern of your choice. If you are making a circle, place pairs opposite each other as you go. Hammer the rebar in place and replace the heads. You can tie some of the cut strips together so they look like they are holding hands if you set them close enough (ours looked kinda dopey like that so we didn’t.) We had some really strong winds today and I’m happy to report that none of the witches were damaged! 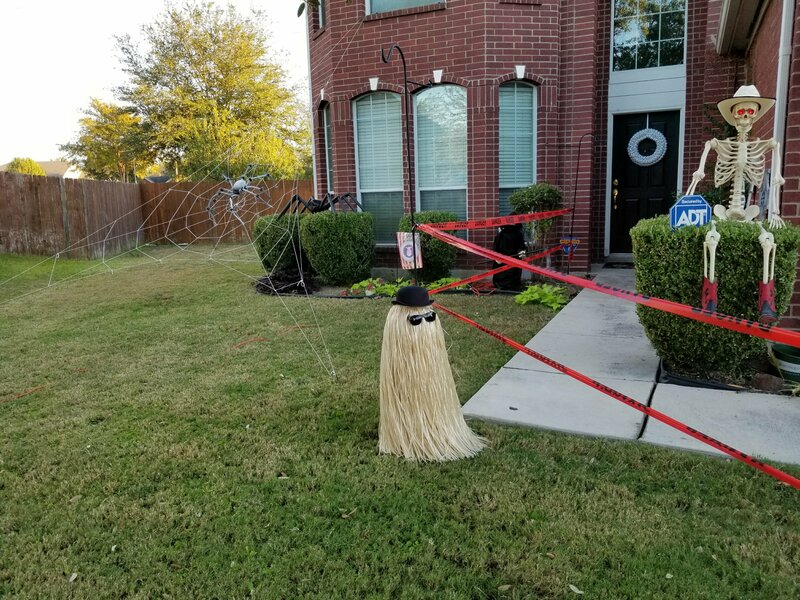 You never know how your decorations will do until they make it through a good storm! Your witch circle is complete! Woooooo hoo witchy woman, see how high she flies! Woo hoo witchy woman, she got the moon in her eyes! Our attitude towards Halloween (and most of life) is go big or go home! Here’s what the rest of the yard looks like. 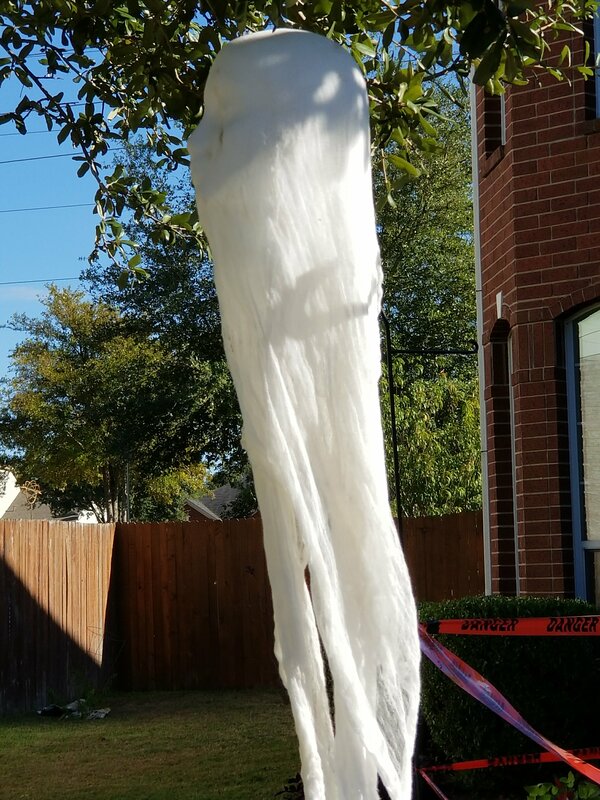 I had to put my packing tape ghost back on the form this year. I just threw her in the garage last year. Big mistake! Take the time to pack your homemade Halloween creations properly or you’ll end up having to remake them every year! And a BIG THANK YOU to everyone who has visited my blog this month! I have had ten thousand visitors, just in October! Woo hoo! 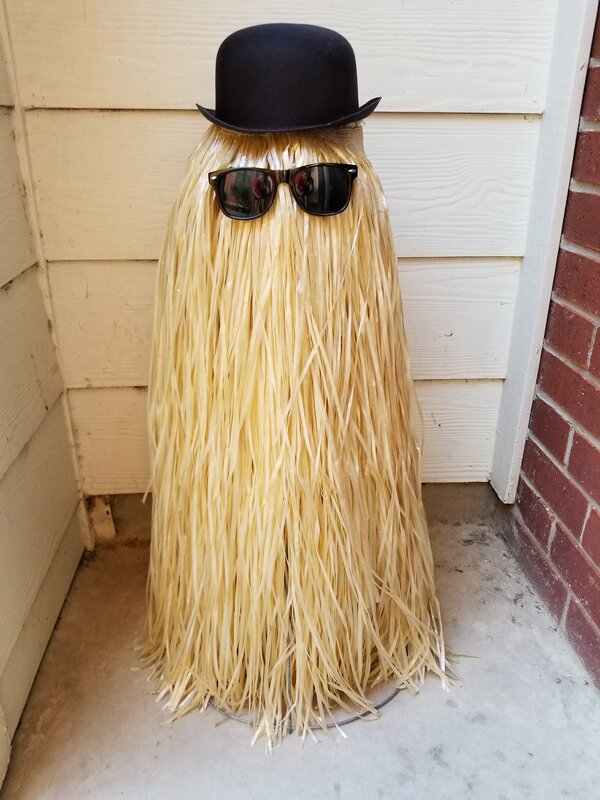 Previous PostCousin It… Oh Yeah! Next PostMother’s Day Raised Hugelkultur Bed! i am a huge fan of Halloween myself. We live in Sweden so Halloween decorations were hard to find. We have made a lot of our own decoations too. Now Halloween is more popular. I usually buy Halloween decoations out of season to get best discounts. Enjoyed your post. Thanks so much for your detailed instructions. 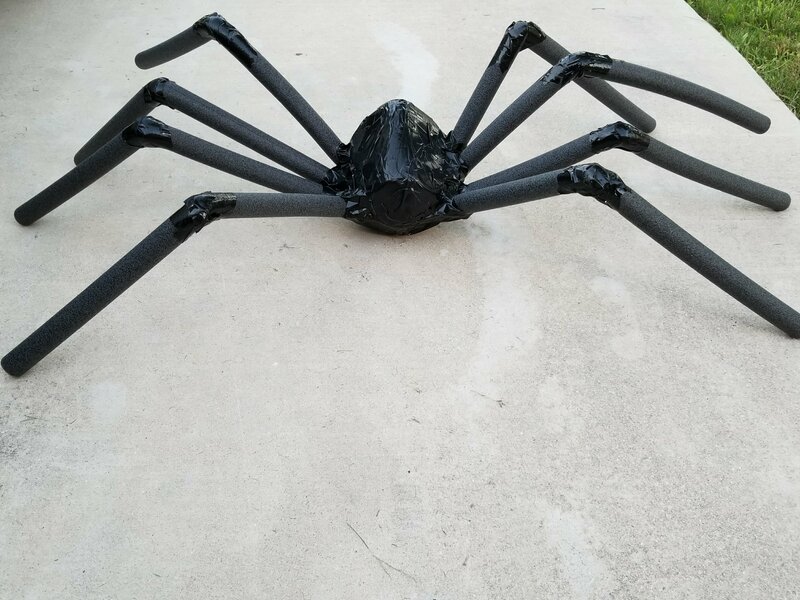 I may make a stuffed body over a PVC frame for a bit more structure then slip that over the rebar, but you’ve given me an excellent starting point. Thanks for sharing.